Upon returning from the library the other day, my eleven year old stepdaughter, Kaitlin, proudly handed me a book she'd picked out for me to read from the young adult section. Not because she thought that I could only read young adult books, but because it had, yep, an airship on the front cover! 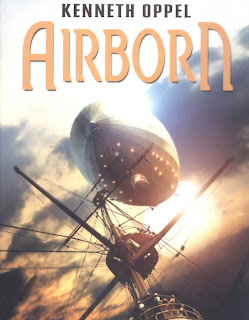 Airborn, by Kenneth Oppel is an entrancing tale of a cabin boy aboard the Aurora, a vast airship sailing the world in an alternative victorian-esque reality. So alternate, that the arrival of a pirate airship seems almost expected and ofcourse there are no shortages of the fictional Hydrium gas, with greater lifting power than helium and hydrogen. I won't spoil the plot for you, but if you have teenagers that you'd like to get interested in airships, I think this would be a nice way to do it. The website is fun, and an interview with the author in the back of the book reveals someone who also appears to be wishing for the day when he could ride in the same kind of splendor that Graf Zeppelin and the Hindenburg bought to the world. Apparently the book has been optioned for a movie. I wonder if they'll need a Zeppelin to star in it...?? I love that book! It's what got me interested in airships in the first place. I've also noticed it has Zeppelins that are very detailed and have most of the features a real airship would have to have. By the way, I think it's really cool that you guys got an airship. I hope you bring back that industry so I can have a job on an airship when I'm older!